← Is Stress Making You Over-Eat? We all know that the body needs some fat in your diet, It’s the kind of fat that’s important. There’s bad fat and good fat. Good fat doesn’t raise LDL levels of your cholesterol, raising LDL is bad. It’s the LDL in your blood that clogs your arteries. That cause strokes and heart disease. Is that a big problem?, you might ask. Yes, in the past century, back when people used real butter the percentage of people with heart disease was about 33%, today it’s about 50%. Much of the increase is due to the artificial ingredients in foods. It’s hard to eat fresh today. In Europe people are accustom to grocery shop several times a week, but we never got in that habit. Eating fresh requirers several trips to the store every week and still your hoping the produce and breads are fresh. I try to fine a store that’s always busy. One store near my house, sells so much produce they are filling the displays contently. Fish is something else you have to buy fresh. This is a good example of a good fat. Many fish contain the fats you need. Naturally fatty fish like salmon, mackerel, herring, lake trout, sardines, and albacore tuna are good sources of omega-3 fatty acids. These are “good” fats that help keep your heart healthy. They may also help keep your brain sharp, especially as you get older. The American Heart Association suggests eating two servings of fatty fish a week. A serving is 3 ounces — about the size of a deck of cards. Try it baked, grilled, or poached. Avocados are another good source of fats. Others are seeds and nuts, olive oil,eggs but only one a day, beans but not baked beans and some vegetables like spinach, kale and brussels sprouts. You can also look for foods fortified with Omega 3 fatty acid, like bread, eggs and milk. If you want to eat healthy you need to read about it. You can find many good website about healthy eating. Stay away from the sites that want to sell you something. All sites have advertising, that’s not what I mean, some sites just want to sell diet programs or diet supplements or DVD’s on exercise and they don’t give any real information. You don’t have to spend money to get information. 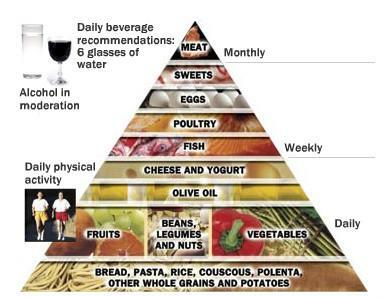 You don’t have to buy anything to fine a good diet program like the Mediterranian Diet. I have a copy of the Mediterranean Diet on my other website: “blogonlosingweight.com” and look through the achieves and you’ll find a post about the diet. I like this one because it’s a complete change in your eating habits and you stick with it and you’ll lose the body fat.